about our book; Miracles in Red. Below are Sophie, and Gabriel. God has many ways of healing, and comforting our hearts when we need it the most. Thank you for sharing this precious story! 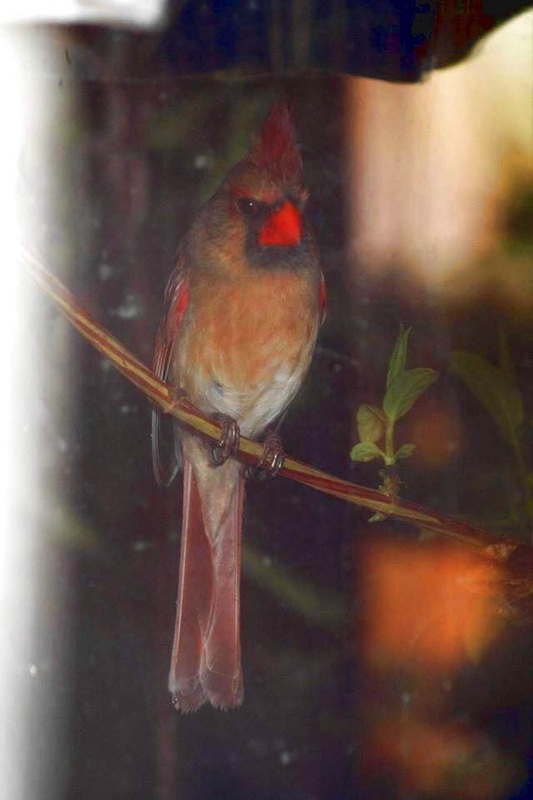 You all know about our cardinal that has been sitting in our kitchen window since before Christmas...we named him Gabriel, he's bright red and beautiful!! I've been thinking that Gabriel sometimes isn't as bright red. 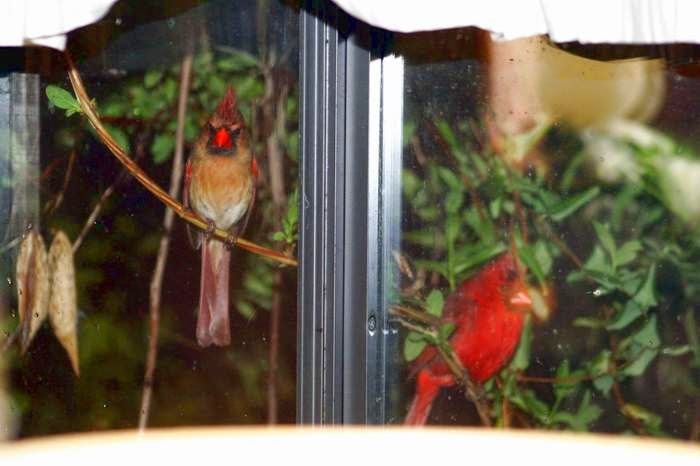 I have now realized that we have 2 cardinals!! They never sit there at the same time. Gabriel being bright red, which means he is male, and kind of on the chubby side. The other is more grey with red tipped wings and red around it's beak and eyes, which means it's a female...and much skinnier. We have now named this one Sophie. I posted a picture of Gabriel, the next time Sophie's sitting there I will get a pic and post one of her. I love those birds being there!!! Blesses me every time I look out that window!! Was finally able to get a picture of Sophie last night although it's not the best, she's the cardinal more grey in color with the red beak. And a bonus....Sophie and Gabriel together!! First time I've ever seen them out there together!! And it was on my grandma's birthday, her first birthday in Heaven! The blessings of my 2 cardinals just keeps getting better and better!! For those of you that don't already know, Gabriel came to me between Christmas and Thanksgiving when I was really missing my mama and sat in my kitchen window...the place I think of my mom the most. Continues to come to this day...I consider it a gift from God to comfort me and let me know that my mom and grandma are still and always will be with me in some way!! May God send His comfort, peace and love to all of you!